Washington Monthly | Will Science Make a Recovery in a Democratic House? Back on November 11, I did a piece focused on the House Administration Committee and its presumptive chairwoman in the next Congress, Rep. Zoe Lofgren of California. Today, I’d like to focus on the House Committee on Science, Space, and Technology. Neither of these committees are considered plum or prestigious assignments but they both have important roles to play. In the case of the House Administration Committee, they are responsible for overseeing all federal elections and the integrity of our voting systems, which will be hot topics next year. The Science Committee won’t be handling anything so high-profile, but they do have jurisdiction over an alphabet of significant federal agencies, including: NASA, the Department of Energy, Environmental Protection Agency, the Agency for Toxic Substances and Disease Registry, National Science Foundation, Federal Aviation Administration, National Oceanic and Atmospheric Administration, National Institute of Standards and Technology, Federal Emergency Management Agency, the U.S. Fire Administration, and the United States Geological Survey. After 8 years in the political wilderness, Representative Eddie Bernice Johnson (D–TX) is relishing the chance to “restore the credibility” of the science committee in the U.S. House of Representatives. With Democrats winning control of the House, Johnson is in line to move from ranking member to chair of the panel when the 116th Congress convenes in January 2019. And she says ending the committee’s ideologically driven fights over climate change, management of the National Science Foundation (NSF), and other research topics is high on her agenda. She feels that the polarizing 6-year tenure of Representative Lamar Smith (R–TX), the current science panel chair who is retiring, was an anomaly for the typically low-key panel she joined as a new member in 1993. She is hoping her Republican colleagues take a less partisan approach to the committee’s business now that Democrats are in charge and Smith is out of the picture. Trained as a psychiatric nurse, the 82-year-old Johnson served for more than a decade in the Texas legislature before coming to Washington, D.C.
Q: Are you worried that some Democrats will leave the science committee for what they consider to be better assignments now that their party is in charge? …Q: You’re going to have several slots to fill on the committee. How will you sell new members on joining? A: We’re looking at those with STEM backgrounds, and I think the environment [on the committee] will be much improved. People with STEM degrees are some of the smartest people in Congress, and they are very no-nonsense people. And you could say that, in the last 6 years, in many ways, they have wasted their time sitting on the committee. But that will certainly not be the case in the next Congress. Elected to Congress in 1992, Rep. Johnson came from the Texas state legislature. The first bill she introduced there, in 1974, was an effort to get women more involved in science. When she got to Washington DC, the then-chairman was Rep. George Brown Jr. of California who was familiar with her interests and invited her to serve with him on the Science Committee. It took twenty-five years, but now she has gained the seniority required to take the gavel for herself. She will turn 83 years old on December 3. Since the next session of Congress is unlikely to pass climate legislation, the real action will be in the hearings the House Democrats hold, and that’s really where the competition will get heated. Clearly, Rep. Johnson intends to get some attention. One of her other main concerns is how the Republicans have politicized the grant process of the National Science Foundation. Q: You said on election night that one of your goals is to “restore the credibility of the science committee.” When was it lost, and what will it take to recover it? A: I think that we lost it under the leadership of Lamar Smith. And to restore it is to follow the charter of the committee. I’m not saying that it will be easy, because we still have a Cabinet and a president that is not necessarily on our side in terms of scientific endeavors. However, it should not keep the committee from functioning as it should function. Q: What was the committee doing instead? A: We were doing more digging, trying to uncover any information that would undercut scientific findings, avoid facing what the scientific data were showing us, and attempting to annihilate much of [NSF] by doing overreach and telling NSF what to fund, which is really not our role. There were a number of things [Smith did] that I disagreed with. But [Democrats] were not in charge. And I think that there were Republican members of the committee who didn’t agree with the leadership, but they just didn’t challenge it. Q: To what extent did NSF bring that scrutiny on itself, such as its problems managing construction of the National Ecological Observatory Network? A: No agency is perfect, and if you poke around enough you’ll probably find something. But NSF did have, and has had, a sterling reputation with its peer-review system and choosing what areas to fund. And I felt they had done a pretty good job. All agencies could stand some oversight, which is our responsibility. But I think it can be done with an open mind in a way that allows the committee and the agency to function. Just because you disagree with a particular award should not be the reason to try and destroy the whole agency. … [Under Smith, Republican staffers examined hundreds of NSF grants in search of those it felt were a waste of tax dollars.] We do have oversight authority, but we don’t have the responsibility to tell them what to fund. Given the catastrophic wildfires in California this fall, there may be a role for the Science Committee in their oversight role of the U.S. Fire Administration. Rep. Johnson represents the Dallas area, but the recent flooding in Houston may be another subject of interest for her, as well as oversight of FEMA more generally. A former chair of the Congressional Black Caucus, Rep. Johnson will be one of many African-American committee or subcommittee chairs in the next Congress. The Republicans are sure to rehash a controversy that arose in 2010 when she improperly awarded Black Caucus scholarship money to four relatives and two children of a top aide. That’s an unfortunate blemish on an otherwise sterling record of public service. Now she enters the most significant period of her career. If nothing else, Democratic control of the House Science Committee will give nerds a good reason to watch CSPAN again. If you enjoy reading this kind of material, please consider making a donation during the fundraising drive we’re conducting over the next eight days. In fact, do it right now. Give whatever you can—$10, $20, $30, $50, $100, $1,000—and for a limited time only your contribution will be matched, dollar for dollar, thanks to a generous challenge grant we’ve received from NewsMatch. 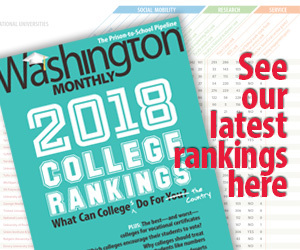 Your contributions to the Washington Monthly are vital, tax-deductible, and much appreciated. I’ll do more pieces on House committees between now and when the Democrats take control January, so stay tuned. The GOP is filling government with fake scientists who will give them a fake scientific consensus.